"Left out of our Zamrock investigation, for stylistic reasons as well as logistical concerns, were albums released after Zamrock's heyday, when the music of '80s Zambia came to be influenced by disco and rhumba from neighboring Congo. Bands that didn't adapt sounded outdated. Thus even Zamrock's greatest band, Witch, splintered, with a skeleton crew of core members embracing younger musicians to record and release two albums that found the band replacing fuzz guitars with whirling synthesizers and trying their hand at soul, disco and boogie. According to Patrick Mwondela, the keyboardist on these albums and the only member of the later Witch still living, the influences on the band had grown beyond the earlier pull of the Rolling Stones, Grand Funk Railroad, and Deep Purple to include the Bee Gees, Commodores, Earth Wind & Fire, Kool & the Gang and Michael Jackson. The band privately issued these two albums -- Movin' On in 1980, Kuomboka in 1984 -- in small quantities before a dearth of gigs and the large ensemble's overhead caused them to disband, sometime in 1985. Zambian music researcher Leonard Koloko calls these later Witch albums 'of international standard and genius' and, superlatives aside, these recordings sound as good as anything coming out of London and Lagos' international recording circles of the time. Though but a decade separated the first and last Witch albums, the recording capabilities of most nations in sub-Saharan Africa by 1984 had caught up with the rest of the world. Finally, fans of the Witch's arch can listen to, and acknowledge, the breadth of this great band and assess for themselves the recordings of both of Witch's incarnations." 2017 repress. "Our comprehensive overview of Zambia's premier garage, psych, prog, funk, afro-rock ensemble Witch... The band's third album, Lazy Bones! !, is the band's masterpiece -- a dark, brooding psychedelic opus that makes equal use of wah-wah and fuzz guitars, that relies as heavily on the stomping feel of hard rock as it does the syncopation of funk." 2019 repress. "The band's fourth album -- recorded after the band toured with Osibisa -- makes use of traditional Zambian rhythms and folk melodies alongside progressive rock movements. It is the most 'afro-rock' of Witch's oeuvre." 2019 repress. "Our comprehensive overview of Zambia's premier garage-, psych-, prog-, funk-,Afro-rock ensemble Witch, We Intend To Cause Havoc!, is now sold out in its 6LP box set form. So we are making the first four Witch albums available in archival reissue form. As with our box set, the audio is nigh-perfect -- restored and remastered from the original master tapes. The entirety of Witch's first album, restored and remastered from master tapes, and presented as an archival reissue. Witch's musical arc is contained to a five year span and, in retrospect, is a logical one. The band's first two, self-produced albums - released in unison with the birth of the commercial Zambian recording industry -- are exuberant experiments in garage rock, and are as influenced by the Rolling Stones as they are James Brown. Thus Introduction, their first, is the perfect starting point for anyone interested in delving into the Witch band, or Zamrock in general." Repressed. 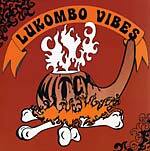 "The complete works of Zambia's legendary garage, psych, prog, funk, Afro-rock ensemble. 1972-1977. Witch's five albums and rare 7" tracks presented as a 4CD (5 3/4"X10") box set, restored and remastered from the original tapes. Contains a twenty-four page booklet with never before seen photos and ephemera; extensive liner notes and annotation; an interview with bandleader 'Jagari' Chanda. By the mid 1970s, the Southern African nation known as the Republic of Zambia had fallen on hard times: self-imposed, single party rule; a decline in prices for the country's largest natural resource, copper; conflict in other countries on Zambia's borders. This is the environment in which the Zamrock scene that flourished throughout that decade emerged... fuzz guitars were commonplace, driving rhythms as influenced by James Brown's funk as Jimi Hendrix's rock predominated, musical themes were often bleak and bands largely sang in the country's constitutional language, English. Although Witch is the best known Zamrock ensemble and although they succeeded in releasing five albums in Zamrock's golden years -- they never made an impact on the global scale in, say, the way afro-beat maestro Fela Kuti did. Travel to and within Zambia is expensive, and the markers for the Zamrock scene are now few. Only a small number of the original Zamrock godfathers survived the AIDS epidemic that decimated this country. Witch's musical arc is contained to a five year span: The band's first two, self-produced albums, released in unison with the birth of the commercial Zambian recording industry, are exuberant experiments in garage rock, and are as influenced by the Rolling Stones as they are James Brown; their third albun, Lazy Bones!! 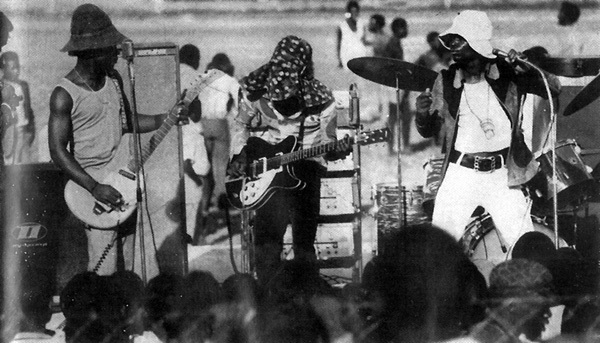 is the band's masterpiece, a dark, brooding psychedelic opus that makes equal use of wah-wah and fuzz guitars, that relies as heavily on the stomping feel of hard rock as it does the syncopation of funk; the band's last two albums, recorded after the band toured with Osibisa, make use of traditional Zambian rhythms and folk melodies and are the most 'afro-rock'of Witch's oeuvre." QDK Media presents the stellar first album from Zambian psych-rockers Witch -- originally privately-pressed on a small local label in 1973. Another out-of-nowhere African '70s rock discovery in the Blo mold, this five-piece electric band plays in a strong, electric African underground style. Introduction features tons of wah-wah fuzz guitar on every track, African-style beats and vocals and all original songs. After the successful release of the other Witch album Lazy Bones!! (QDK 050CD), here is Introduction, with crazy and wild fuzz guitars all over and chanting -- as good as it gets. An incredibly cool and stoned album from Africa. If you're feeling depressed, low, disturbed, out-of-sorts, sad, frustrated or demented, then folks, we suggest you seek out a quiet place, indulge in some soothing meditation and cut away that headache by listening to this inspirational album. Band members include: Chris Mbewe (lead guitar, vocals, acoustic guitar); John Muma (rhythm guitar, vocals); Gedeon Mulenga (bass); Boidi Sinkala (drums); Emanyeo Jagari Chanda (vocal, percussion). 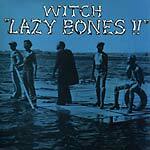 QDK Media releases an official reissue of Zambian psych-rockers Witch, with their ridiculously good Lazy Bones! !, originally released in 1975. By the mid 1970s, the South African nation known as the Republic of Zambia had fallen on hard times. The new Federation found itself under party rule. Zambia's then-president engaged what was then Southern Rhodesia (now Zimbabwe) in a political fencing match that damaged his country's ability to trade with its main partner. The Portuguese colonies of Angola to the west and Mozambique to the east were fighting their own battles for independence; conflict loomed on all sides of this landlocked nation. This is the environment in which the catchy -- if misleadingly-titled "Zam Rock" scene that flourished in 1970s Zambian cities such as Lusaka and Chingola emerged. Though full of beacons of hope for its numerous musical hopefuls, it was a tumultuous time, and it's no wonder that the Zambian musicians taken by European and English influences gravitated to the hard, dark side of the rock and funk spectrum. From the little of the Zambian '70s rock and funk music that has been spread via small blogs and bootlegs -- the likes of Chrissy Zebby, Paul Ngozi and the Ngozi Family, and the devastating Peace -- we learn that fuzz guitars were commonplace, driving rhythms as influenced by James Brown's funk as Jimi Hendrix's rock predominated, and the bands largely sang in the country's national language, English. 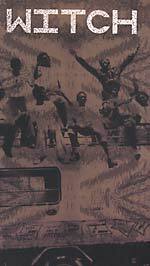 The European and North American compilers that had, say, fallen in love with the wonders of Nigeria's '70s scene via an introduction by Afro-Beat maestro Fela Kuti and decided to journey to Lagos to investigate further never even bothered to visit Zambia. Only a small number of the original Zam Rock godfathers that remained in the country survived through the late-'90s, when the music recorded in Zambia became the next frontier for those global-psychedelic rock junkies searching for the next fix. Normal Records, in conjunction with Los Angeles' Now-Again Records and Zam Rock pioneer Rikki Ililonga licensed this album from the last remaining member of Witch, Emmanuel Jagari Chanda. Hopefully, the music he and his late compatriots created will now reach a larger audience. One that they truly deserve. Another out-of-nowhere African '70s rock discovery in the Blo mold, privately pressed on a small local label, this five-piece electric band plays a strong electric African underground style. Tons of wah-wah fuzz guitar in every track, African-style beats and vocals and all original songs. If bands from Nigeria such as Blo and Ofege and bands from Zambia such as Rikki Ililonga and Chrissy Zebby are all traveling on the psychedelic highway at 100 mph, the Witch overtakes them with 120.